In 1985, I took part in the “Tulum Lighthouse Project,” a project of the Instituto Nacional de Antropología e Historia (INAH) which was underwritten by the National Geographic Society and the Kempner Fund. 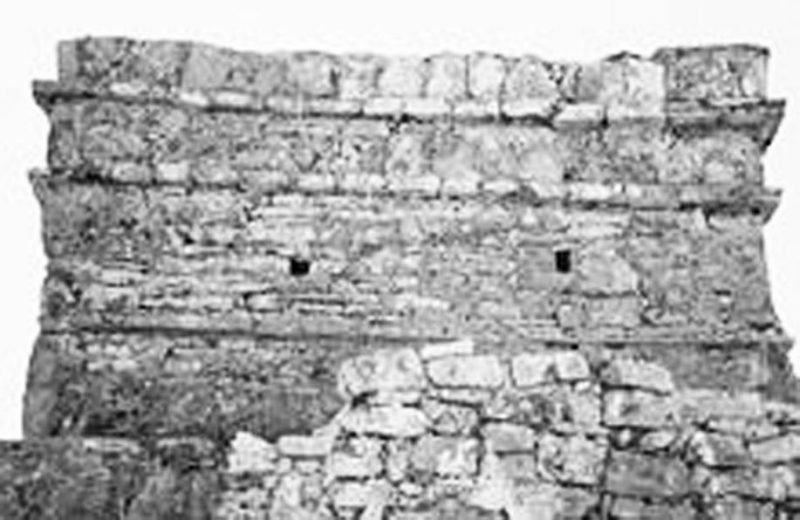 The project was the idea of Michael Creamer, an American who came up with the theory that the twin window/vent holes on the ocean-facing side of the building in Tulum known as “El Castillo” could act as a sort of range light system for Mayan canoes attempting to cross over the reef at night to land on the beach next to the building. To help test the theory, I borrowed a dugout canoe that had washed up on the beach at Cozumel and that Arturo Becerra was using as decoration in front of his restaurant on Avenida Melgar. A good friend of mine, Bill Horn, took the canoe to Tulum, along with all the supplies we would need for the time we would be staying at INAH’s base camp the institute maintained just north of the beach by El Castillo. Other members of the team included INAH archaeologists Pilar Luna and Santiago Analco, Texas A&M School of Oceanography graduate student Vel Lena Steed, Michael Creamer, Aqua Safari dive shop owner Bill Horn, and divers Pamela Holden and my wife, Marie-France Lemire. Creamer believed that by building a fire within the small uppermost room atop El Castillo, the Maya had utilized the beams of lights from the two 18-inch-wide openings on the side of the building facing the sea as range lights for an aid to navigation. Because of the thickness of the wall in which the openings were set, the beams of light they projected could only be seen when one looked directly into them. If one was not lined up exactly perpendicular to the back wall of the building and these openings, the lights were not visible. The reef in front of Tulum, Michael reasoned, must have been dangerous for Mayan canoes to negotiate at night, but if these range lights could help them align their canoe with an opening in the reef directly in front of El Castillo, they could paddle through the pass and land safely. That was the theory. The first thing Pam and I did after camp was set up was to take our zodiac out to the area where Creamer believed the pass through the reef lay and mark it with buoys. We found a spot in the reef in front of El Castillo that was deeper than the rest of the reef; however, although it offered over 10 feet of clearance between the surface of the sea and the sea-floor, it was only slightly deeper than the reef on either side of the passage. Unless Mayan canoes had a draft of over 7 feet, they would not necessarily be obliged to use this pass; they could simply glide over other parts of the reef just as easily. In the early 1990s in Rio Belen, (a small village in Veraguas, Panama), I had a group of fellows cut down a huge bateo tree and carve a 45-foot-long dug-out canoe from its trunk for me. We attached a 45-horsepower outboard motor to this canoe (which I christened the Don Tiki) and I traveled all along the coast of Panama in it, from Costa Rica to Colombia. Even when the canoe was heavily laden with 55-gallon drums of gasoline and crates of supplies, it drew less than two feet of water. I frequently surfed this 45-foot-long craft through the breakers and over shallow sand bars as we entered the mouths of rivers and I never had a problem because of the draft of the vessel. Even if you could double the length of the canoe and make it 100 feet long, the draft would not increase proportionately; it would never be more than around two or three feet. The next thing we did at Tulum for the experiment was to wait until after sunset and place a gas lantern inside the small room atop El Castillo. We were not allowed to make a fire within the room, as INAH felt that the smoke and soot produced by the fire would smudge the walls and ceiling. This got me to thinking; if the Maya had built nightly fires within this room so that the light could be seen out to sea, after a short period, the inside of the room would look as blackened and soot-caked as the inside of a fireplace. Why were there absolutely no visible signs of soot or carbon on the walls or in the cracks of the plaster? Granted, we did not take core samples, which would offer the ultimate test of the presence of soot (or lack thereof), but we didn’t see any. The inside of the room was well protected from the elements. The Maya could not have simply scrubbed the residue off of the porous plaster and stone; some traces of it must necessarily remain if fires or torches were ever used inside the room. But we saw none. Besides that, if a fire had been built in the room, the heat rising from it would have eventually damaged the ceiling, which was made of limestone and not very heat-resistant. After we placed the lantern in El Castillo, I took the 12-foot-long dugout canoe that we brought from Cozumel and paddled it out past the reef. As I paddled back and forth in the dark in a line parallel with the back wall of El Castillo, I would see first the light from one window appear, then as I paddled a little farther, the light from the second window would also appear. If I continued to paddle in the same direction, the first light would disappear, then after a few more yards, the second one would go dark. The next thing to do was to see if the patch of ocean where I could see both lights at the same time was directly over the pass we previously marked in the reef. We attached strobe lights to the buoys marking the pass and I tried again. The lights coming from El Castillo were aligned with the space between the buoys. Be all that as it may be, the story of our experiment took on a life of its own. Creamer later re-enacted the experiment (I did not take part) in 1998 for Arthur C. Clarke’s Mysterious Universe –The Mysterious Maya for Discovery Channel. At the end of the program, he states, “As far as I’m concerned, we have proved it.” Later, in 2009, the program was shown on the Spanish version of the History Channel. 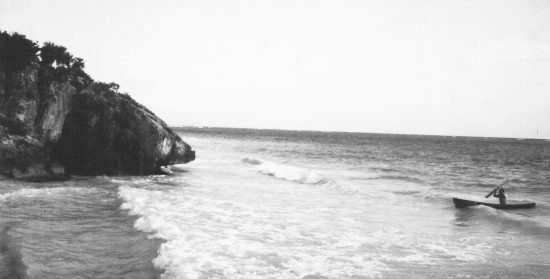 A posting was even made on Wikipedia, stating the experiment we conducted “…conclusively proved that Tulum’s El Castillo served as an aid to navigating the narrow gap in the offshore coral reef.” Today, this theory has evolved into a “fact” that is deeply entrenched in the collective belief of the people who saw these TV programs and read the Wikipedia entry. Undoubtedly, at some point during your visit to Tulum, you will hear someone repeat this revisionist version of the results of the experiment. I want to stress, however, that I am only putting forward what I remember of the experiment and the statements in the original report it generated. The points I have drawn your attention to do not disprove the theory that it was a lighthouse, but in my estimation, offers up a lot of reasons why it was not used as such.